Representatives of Realogics Sotheby’s International Realty and Burrard Group announced a major milestone in the development of the 41-story NEXUS Condominium Tower today as it begins a vertical ascent towards completion in fall 2019. 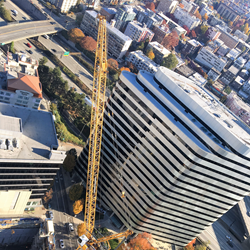 With excavation now complete, SKANSKA, the general contractor for NEXUS, has poured the foundation mat, which comprised of 3,900 cubic yards of concrete and measures up to twelve feet thick. “The entire development and construction team is excited to shift the focus from digging down to building upward and constructing this iconic tower,” said Chad Mathis, Senior Development Manager with Burrard. After analyzing market demand, Burrard also announced a change in the final product offering. The final construction documents include a revision to the floor plates in the “third cube” between levels 28 and 35 where a larger one bedroom and den floor plan will now be built as two independent and efficiently-scaled residences called City Suites – a 484-sq. ft. studio and a 503-sq. ft. urban one bedroom. Conversely, a penthouse home assembled two units to create a 4 bedroom plus den offering nearly 3,200-sq. ft. These revisions increased NEXUS Condominiums by 8 residences to 389 units. “We took this opportunity to optimize the product offering based on market demands,” added Mathis, who acknowledged the flexibility to assemble and disassemble floor plans. Jones points to RSIR research showing that 78-percent of the 496 new condominiums being built in downtown Seattle are currently presold with virtually all remaining homes priced above $700,000. Consumers will find little relief in the resale marketplace as according to the NWMLS, there are only 11 homes listed for sale priced below $700,000. Meanwhile, RSIR reports the median price of resale condominiums sold in October 2017 was $649,500, an increase of 33-percent over the prior year. A preference for newer condominiums was also noted at the recently completed Insignia Condominiums. This presale development was delivered in 2015 and 2016 and experienced four resales last month – all within days of hitting the market, several escalating above asking price and exhibiting an average of 25-percent increases from presale to resale values. Market wide, S&P/Case-Shiller tracked 13.2-percent median home price increases making the Seattle metro area the fastest-rising housing market in the US for the past 12 months. Citing pent up demand, market pundits anticipate the latest sales release at NEXUS will sell out quickly upon listing on November 18th. Recently, the Urban Land Institute heralded Seattle as the #1 investment market in the US as part of their “2018 Emerging Trends in Real Estate” report. However, the opportunity for individual home ownership has been challenging given the dearth of for-sale housing being built. Research by RSIR and O’Connor Consulting Group confirms that no new condominiums will be delivered in 2017 and it’s estimated that 94-percent of the 27,000+ new multifamily housing units to be built in downtown Seattle’s urban center for the current decade will be for rent and not for sale. Mathis says more new condominiums are on the horizon but suspects most developers will want to retain their inventory as income property because the market is appreciating. About Realogics Sotheby’s International Realty (http://www.RSIR.com) - Artfully uniting extraordinary homes with extraordinary lives, Realogics Sotheby’s International Realty is a leading global sales and marketing brokerage firm in the Pacific Northwest. Recognized by the Puget Sound Business Journal amongst the fastest-growing private companies in Washington State for 2012, 2013, 2014, 2015 and 2016 the boutique real estate firm of 225+ brokers consistently rank among the top producing firms within the markets that it serves with branches in downtown Seattle, Bainbridge Island, Kirkland, Issaquah and Madison Park. About Burrard Group (http://www.Burrard.com) – The Burrard Group has been consistently creating quality residential communities for 25 years, and has built a diverse portfolio of master-planned communities, multi-family developments, high-end single-family residences and resort lodging properties throughout Pacific Rim gateway markets. In 2016, Burrard Group established offices in Seattle. Editor's Note: Property photos, aerials and additional market statistics are available upon request.